BETHESDA, Md. — A drill was being conducted Tuesday afternoon when an active shooter was reported at Walter Reed National Military Medical Center outside Washington, the U.S. Navy said. Naval Support Activity Bethesda gave the all clear on the Maryland base that houses the military hospital after security found "no indication" of an active shooter. The NSAB tweeted at 2:15 p.m. that an active shooter had been reported in the basement of a building. Public affairs officer Jeremy Brooks told AP by phone that all traffic had been stopped in or out of the facility. The all clear came about an hour later, after security found no shooter. The Navy tweeted that there was no active shooter at the base, but an "ad hoc drill by tenant command." U.S. Rep. Dutch Ruppersberger of Maryland, who had tweeted that he and about 40 other people were in a hospital conference room when the shooter was reported, later tweeted that "at no point was there any indication that this was a drill." Mary Lock, a nurse at Walter Reed, said she and other employees remained locked down in a second-flood clinic for an hour after hearing this repeated announcement over a loudspeaker: "Active shooter, this is not a drill!" Lock, 58, said they have had drills for events like this, so she didn't panic. "It is nerve-wracking as all get out," she said with a laugh as she left work to catch a bus. 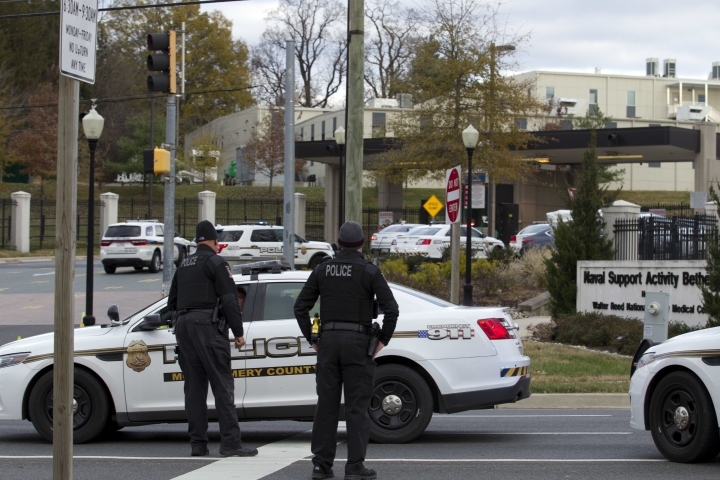 Montgomery County police spokeswoman Lucille Baur said the department sent over units at 2:23 p.m. after a request for assistance in what seemed like a legitimate report of an active shooter. "There was no indication from the call that this could a training exercise," she said. Walter Reed is the nation's largest military hospital and, according to its website, is among the first stops in the continental United States for troops wounded in combat.